The Bangor High School boys basketball team doesn’t like losing. Since suffering their only defeat of the season to date a week ago, the Rams now have back-to-back victories over previously unbeaten teams. On Monday night, they followed up last Friday’s win at Thornton Academy of Saco with a 60-46 triumph over defending Class AA state champion Edward Little of Auburn at Red Barry Gymnasium. Coach Brad Libby’s Bangor team, ranked No. 1 in Class AA North, improved to 8-1 overall and is 2-1 during a five-game stretch stretch that began with a 53-47 loss at Oxford Hills of South Paris last Wednesday. The Rams beat Thornton Academy 53-49 and continue with games at Class A power Hampden Academy (6-1) on Thursday and at home against 5-2 Deering of Portland on Saturday afternoon. Those five foes have a combined 28-10 record. Bangor used its man-to-man defense to frustrate Edward Little’s offense, with the Rams inducing five player-control fouls among 21 turnovers by the Red Eddies. And as EL struggled throughout with foul trouble, Bangor cashed in at the free-throw line — making its first 20 attempts and 24 of 28 overall. Add to that a third-quarter shooting barrage from beyond the 3-point arc that extended the Rams’ 31-21 lead to as much as a 22-point advantage and Edward Little was left to play a futile game of catch-up the rest of the way. Fleming paced Bangor with 21 points, including 10 of 12 from the free-throw line, to go with seven rebounds and three steals. Junior forward Henry Westrich added 16 points on 4 of 7 shooting from beyond the arc, including three straight during a four-minute stretch of the third quarter when Bangor scored 15 consecutive points — all on 3-pointers — to extend a 31-24 lead to 46-24 on Westrich’s third 3-pointer of the run. Westrich also had four steals and two blocks, while senior point guard Damien Vance made all eight of his free throws en route to 14 points. 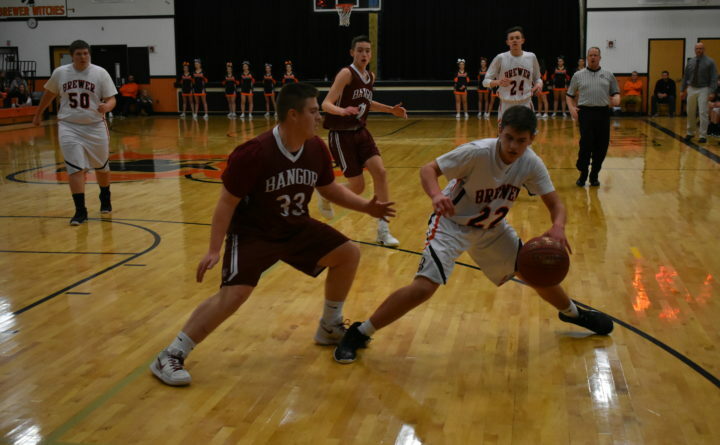 Bangor received solid defensive play from senior guard Isaac Cummings and senior forward Noah Missbrenner, who helped double-team the EL frontcourt players as soon as they gained possession of the ball near the basket. That duo also combined for nine points. Junior guard Austin Brown led Edward Little with 18 points, all on 3-pointers, while senior forward Wol Maiwen added 12 points and 10 rebounds. Junior forward Max Creaser, who scored 30 points during the Red Eddies’ 58-56 double-overtime victory at Portland last Friday, sat out much of the game against Bangor with foul trouble and managed only two points on 1-of-5 shooting.